Around the world, ecotourism has been hailed as a panacea: a way to fund conservation and scientific research, protect fragile ecosystems, benefit communities, promote development in poor countries, instill environmental awareness and a social conscience in the travel industry, satisfy and educate discriminating tourists, and, some claim, foster world peace. Although “green” travel is being aggressively marketed as a “win-win” solution for the Third World, the environment, the tourist, and the travel industry, the reality is far more complex, as Martha Honey reports in this extraordinarily enlightening book. Honey is not a “travel writer.” She is an award-winning journalist and reporter who lived in East Africa and Central America for nearly twenty years. Since writing the first edition of this book, she has led the International Ecotourism Society and founded a new center to lead the way to responsible ecotourism. Her experience and her expertise resonate throughout this beautifully written and highly informative book. 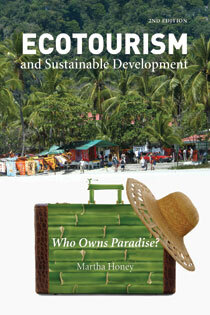 "Highly acclaimed as the most comprehensive study of both the theory and practice of ecotourism...The new edition...marks a major rewrite of the original book." "Honey's definition of ecotourism is ambitious." PART I. What Is Ecotourism? Chapter 2. The World Travel Industry: Going "Green"? Chapter 6. Tanzania: Whose Eden Is It? Chapter 8. Kenya: The Ups and Downs of Africa's Ecotourism "Mzee"